In an effort to better study neurological diseases such as autism and schizophrenia, Austrian biologists are growing human brain cells in a petri dish. 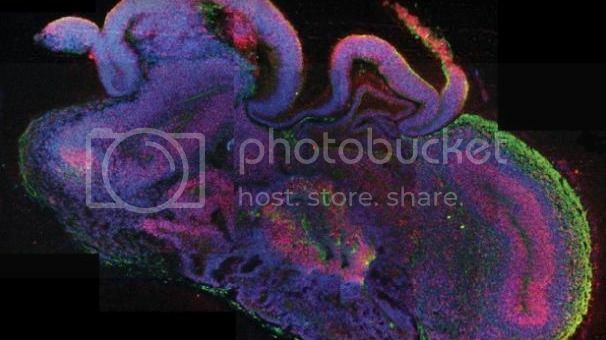 "The complexity of the human brain has made it difficult to study many brain disorders in model organisms, highlighting the need for an in vitro model of human brain development," the authors write in the Aug. 28 issues of the journal Nature. They created the pieces of human brain tissue using embryonic stem cells and induced pluripotent stem cells, which come from human skin and blood cells. At three to four millimeters, the 3D model cells are about as developed as the brain of a 9-week-old fetus. They already resemble distinct regions of the brain including the dorsal cortex, ventral forebrain and an immature retina. The cells will not grow much more, as it is harder to get enough nutrients and oxygen to the cells to continue growing beyond 4 millimeters. "The parts are correctly organized, but not put together," study coordinator Juergen Knoblich said in a press conference, going on to describe it as "a car where you have an engine, you have the wheels -- but the engine is on the roof... that car would never drive, but you could still take that car and analyze how an engine works." Based out of the Institute of Molecular Biotechnology in Vienna, the scientists say that studying human brain cells is better than studying animal brains, as there are such differences in brain development between the different species. Human liver and heart tissue have been studied in a similar fashion. While growing a brain might seem different, it is, at the end of the day, simply another not-so-simple organ that needs to be understood in order to advance medicine and science. Scientists can grow single brain cells.... long term.....this augers well for JQ.... posters may be able to be upgraded to DOUBLE capacity brains! I was wondering if they were going to be distributed at JQ. Science has not got THAT far yet!